Introduction: Topiramate is a well-known anticonvulsant drug with a broad spectrum of actions. It has been proposed in the treatment of several types of epileptic seizures both in monotherapy and in add-on. Its usage has been extended to other disorders including migraine, essential tremor, obesity, alcohol and drug addiction. The most frequent side-effects of topiramate include dizziness, somnolence, insomnia, and ataxia. Paraesthesia, metabolic acidosis, kidney stones, hypohidrosis, cognitive impairment and eye symptoms have also been reported. Case Report: We report on a girl affected by epileptic seizures treated with levetiracetam for five years. Due to worsening of the seizures, the dosage of this drug was increased and afterwards lowdosage topiramate was initiated. 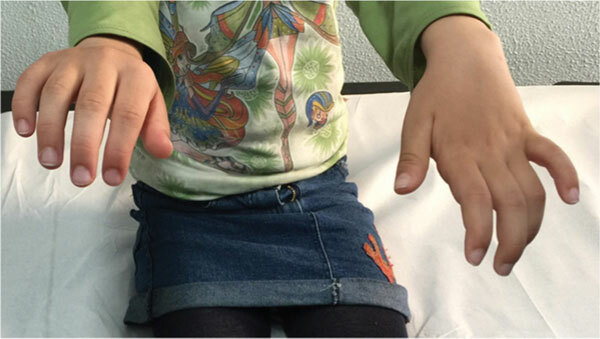 After 12 days from the introduction of topiramate, the girl began to present neurologic signs including limbs rigidity, pain, incoordination and flexed fingers. Gradual withdrawn of the topiramate resulted in progressive resolution of the symptomatology. This clinical episode could represent a probable topiramate-related side effect (Naranjo score 5), never reported before in this form. Keywords: Topiramate, levetiracetam, side-effect, paraesthesia, rigid flexion, naranjo score. Keywords:Topiramate, levetiracetam, side-effect, paraesthesia, rigid flexion, naranjo score. Abstract:Introduction: Topiramate is a well-known anticonvulsant drug with a broad spectrum of actions. It has been proposed in the treatment of several types of epileptic seizures both in monotherapy and in add-on. Its usage has been extended to other disorders including migraine, essential tremor, obesity, alcohol and drug addiction.